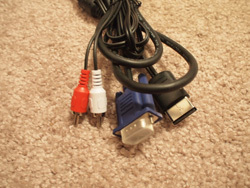 I recently got back from China and on my trip I picked up some Dreamcast VGA cables. They are currently on eBay selling for $45 with slow shipping from China, but I will sell you one for $42 including shipping from the US. I've uploaded some pictures, click on the picture below for more detailed pictures. I will test each one individually before shipping and ship in a padded envelope. Thanks for looking! I am selling on a few other sites, so take this sentence as verification it's me! couple questions: are these official sega dc cables or are they 3rd party? have you tested them yourself and is there any 'noise' in the signal or is it clean and clear? Sup EKX. They are not first party, first party ones go for a lot more than this! I test each one myself and they work just as well as a VGA box I bought many years ago. No noise at all, clear picture.